If you are searching for feathers for centerpieces or crafts, then you have come to the right place! 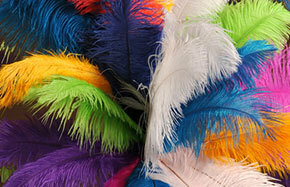 Our wholesale feathers in bulk are perfect for event design projects. Flowers are often associated with wedding arrangements, but what about feathers? Our products are perfect for use alone or with your finest blossoms. Place a few long, thin pieces in to give a traditional bouquet a touch of personality and diversity. Incorporate brightly colored ostrich feathers instead to add detail to your modern look. There is something captivating about ostrich feathers. They come in so many shapes and sizes with breathtaking patterns that are often difficult to recreate. Many different feathers have become popular components when designing event décor and bouquets. Each brings its own unique profile and lovely texture that excites the senses and enhances the overall presentation. 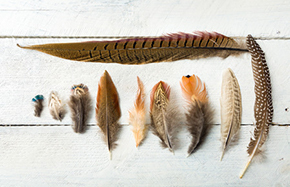 Whether you are searching for something natural or outrageous, our website can guide you to high quality decorative feathers for any occasion. If you are searching for more variety, then our ostrich feathers offer the best options. We carry one pound packages that include 13” to 16” drabs or longer 18” to 22” plumes. Each piece features fine detail and an enchanting style, which is may even more alluring by our enormous color selection. Purchase common colors, such as white, grey, black or brown or look for something wilder like magenta, orange, lime or royal blue. We even offer four fluorescent hues that will glow under a black light. There is nothing that our ostrich feathers can’t do when it comes to decorating your venue or making wearable accessories for the bridal party! If you love organic themes, then our pheasant and peacock feathers will be a great fit for your event! We offer handsome pheasant tail feathers that feature long, tapered tips with the trademark dark brown and black striping often noticed on this beloved bird. Choose between two packages, one featuring 200 20” to 24” pieces while the other offers 400 12” to 16” pieces. 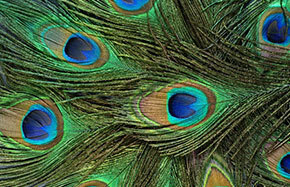 Our peacock feathers are just as lovely, with a touch of wild allure. We carry different styles, stating with the ever-popular large eye tail feathers. These 30” to 35” accents include a dark coloration with wispy tendrils that become denser at the top. The brown hue becomes a backdrop for the stunning iridescent eye pattern that appears on each. If you want something simpler, we also carry peacock tail swords that measure 20” to 25” long with a thinner profile and more even coloration. No matter which you choose, each piece will be luxuriously soft and add eye-catching texture to any display. Individual feathers are beautiful, but are not always easy to hang or drape. 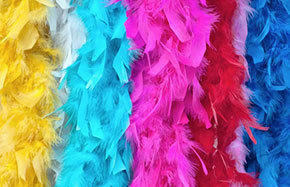 You can browse our list of feather boas to find the same extensive color options in a length rather than individual piece. You will find five different sizes, starting at 20 grams and going as high as 120 grams.